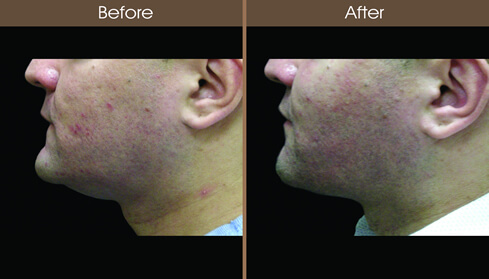 42 year old male concerned with his neck contour underwent neck/submental liposuction and Smart Lipo Laser Liposuction. He felt that the added neck volume made him appear overweight even though his weight was appropriate. In addition, the neck laxity and fat made him look older. The procedure involved a tiny 2 mm submental (under the chin) incision and Smart Lipo Laser liposuction to melt the fat. This was followed by tumescent liposuction to remove the excess tissue. SmartLipo Laser energy was then used to tighten the skin.